through an improvised garbage receptacle searching for explosives. 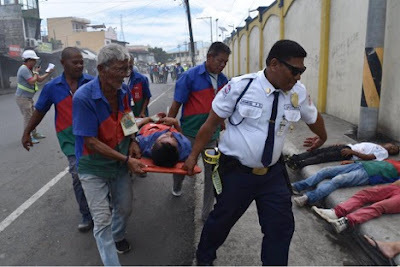 SURIGAO CITY - Panic and cries for help broke loose as injured bodies littered inside the passenger terminal building (PTB) in this seaport seconds after an explosive device exploded on Wednesday morning, July 27, port authorities said. Port Manager Mildred Padilla said the ‘terrifying scene’ accounted for 3 casualties, 17 injured persons and dozens of passengers and port users evacuated as a result of the mock explosion minutes after an abandoned bag was ‘found’ by a security guard inside the PTB and was reported to the Port Police Division. Padilla said it started at around 10:30 a.m. when SG Freddie Romero, a roving guard, noticed an abandoned bag near the ticketing booth but when he checked about the ownership of the bag the latter failed to locate its owner as passengers or persons near the location deny ownership of the same and failed to notice who brought the said bag in the area. PPA security guard Freddie Romero leads porters in evacuating a wounded victim while Engr. Jun Bayang (in white helmet) is shown busy directing the flow of evacuation. “The guard then informed PP/Froilan Caturla about the unattended bag and they immediately secured the area together with the help of PP/Insp Dixon Gonzales, security commander Roger Montilla, some guards and porters. 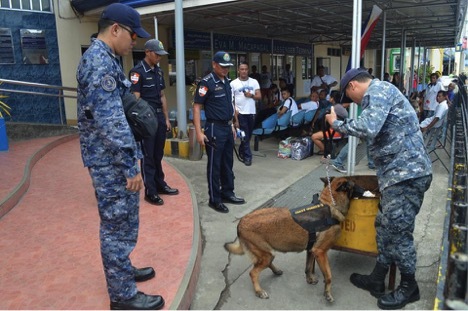 Caturla then called the assistance of the K9 unit of the Philippine Coast Guard so the bag could be checked by a K9 dog," the port manager disclosed. He said while they were busy in the evacuation, the abandoned bag suddenly exploded and a score of people were hit resulting to 3 casualties and 17 injured that were immediately attended to with the timely arrival of the City Rescue Team headed by Mario Gesta and BFP Response Unit led by SFO4 Albert Lerio. The list included LCDR Alberto Ferre of Phil. Coast Guard, P/Supt Noel Silvosa of City PNP, SPO1 Richard Charvet (bomb technician) of PNP Maritime Group, Atty. Manuel Coro and Annette Villaces of CDRRMC, Atty. Manuel Delani of City TMO, Jojo Ferol of DxRS, Alex Salvo of Joy-FM, Nestor Guballa of DxSJ-FM and Branch Manager Edgardo Tidalgo of PCBSI, a cargo-handling in Surigao port.